Agility is a fast, exciting, fun activity for you and your dog. Agility is perhaps the fastest growing dog sport in the world which can be enjoyed by any family owning a dog. Dog agility is a dog sport in which a handler directs a dog through an obstacle course in a race for both time and accuracy. Dogs run off-leash with no food or toys as incentives, and the handler can touch neither dog nor obstacles. Consequently the handler’s controls are limited to voice, movement, and various body signals, requiring exceptional training of the animal and coordination of the handler. In its simplest form, an agility course consists of a set of standard obstacles laid out by a judge in a design of his or her own choosing in an area of a specified size. The surface may be of grass, dirt, rubber, or special matting. Depending on the type of competition, the obstacles may be marked with numbers indicating the order in which they must be completed. Courses are complicated enough that a dog could not complete them correctly without human direction. 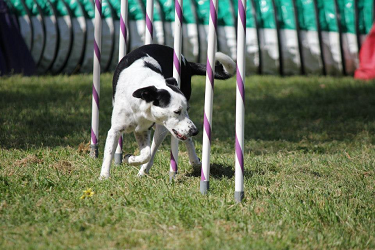 In competition, the handler must assess the course, decide on handling strategies, and direct the dog through the course, with precision and speed equally important. Many strategies exist to compensate for the inherent difference in human and dog speeds and the strengths and weaknesses of the various dogs and handlers. The obstacles comprise various types of jumps, ramps, elevated walks, poles that the dogs weave through, different types of tunnels and a see-saw. To take part in an agility classes you need first to pass our polite dog in society test which is called Geelong Canine Citizen.